A short text adventure by rockersuke, late to join the 1st Festive Annual Amiga Game Making Competition but in time to encourage more comps, more games, and more Amiga fun in years to come. About the game and its limitations. 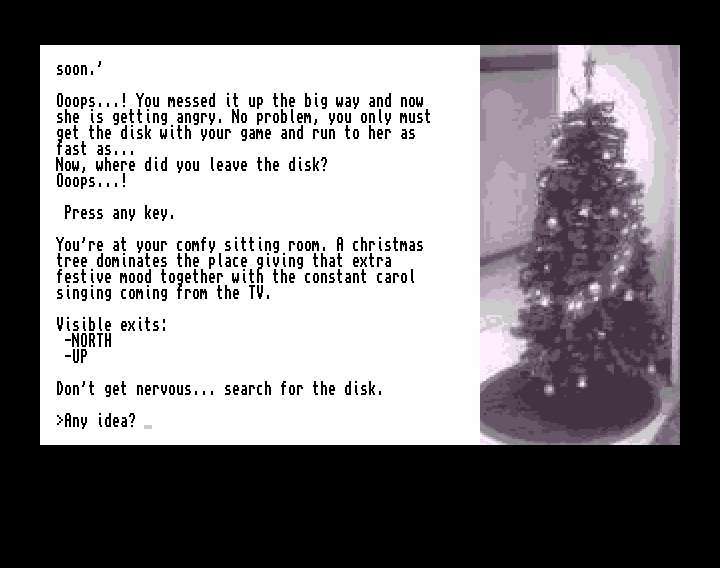 This little brief work of interactive fiction was intended to attend the Christmas 2009 comp, but never made it in time. It is to be considered as a teaser, first chapter, prologue or intro to a complete text adventure game which will eventually be released later. It's been developed with AMOS Professional. Audio samples are CC from jobro and infobandit and the tree picture was taken at my job. Music was written with ModPLug Tracker under Windows. A real parser. Now it only understands commands on a "one sentence-two words" only basis. It will reject any attempt to a more complex input. A native english-speaking person proofreading. A more extense vocabulary. A lot of "guess-the-verb" syndrome is to be expected. A real beta-testing, that's to say, made by someone other than me! If you are not used to text-adventure gaming I suggest taking a look into the wikipedia entry for "Interactive Fiction" for a detailed tour through the medium and its history. GO direction: direction can be any cardinal point or its abreviation. Valid directions are N,S,E,W,NE,NW,SE,SW,UP,DOWN,IN,OUT. Commands as GO NORTH, NORTH, or just N are valid. LOOK: provides a general description of current location. Abreviation L also works. EXAMINE object: returns a description of specified object if it has one. Abreviation EX is acepted. INVENTORY or I: list currently carried objects, if any. SAVE, LOAD (or RESTORE): for saving and restoring your current game. TAKE,GET,DROP,LEAVE: getting or dropping items. TURN object: turns an object on, if applicable. As the parser does not understands more than 2 words at a time It's no use trying to input "TURN object ON". Just "TURN object" will do. SOUND: switches sound effects on or off. MUSIC: switches background music on or off. Both, sound and music commands save their state to a preferences file, so if you're playing from a floppy disk it must be write-enabled. The game will understand the use of "IT" or "ALL" words under certain circumstances. E.G. you can EXAMINE object and then use GET IT as the next command. If there are several items in a location you can try and take them all with a single command using TAKE ALL. To the various authors of Amiga adventure-creating systems. Even if I finally opted not to use any of them, the bare fact that they invested their time and effort on them was encouraging. To Jeremy Freese for his work "Violet", winner of the 2008 Annual Interactive Fiction Competition, which I strongly recommend to both experienced and newcomer text-gaming players and to which my little Amiga game owes more than a couple of concepts. The game has been succesfully executed on a kickstart 3.1 68030 accelerated Amiga 1200 and a kickstart 3.1 68000 Amiga 600. Under WinUAE emulation the game loaded fine in a plain 512 Kb kickstart 1.3 Amiga 500 provided that Workbench was not loaded and consuming memory. So any 1 Mb machine is a safe guess, and a bootable disk with just the game file and a startup-sequence to run it will presumably work in any 512 KB Amiga. Now It works on 68000 based Amigas, as It always was meant to do! Some rather obscure AMOS Pro compiler bug which prevented it must still be properly isolated. Background music available and switchable. Sound and music preferences get permanently saved to a prefs file. Game now does not crash when attempting to pick a non present non pickable item. Thanks to Leffmann for spotting the very first serious bug. 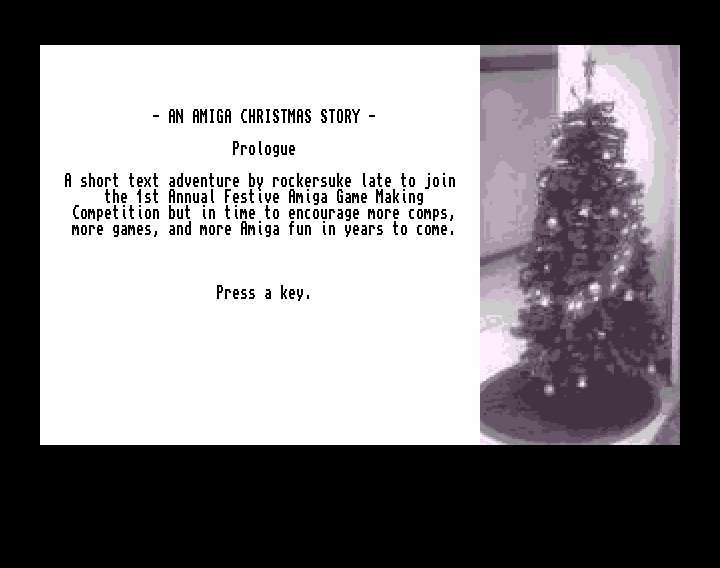 "An Amiga Christmas Story" is freeware, so It's freely distributable as long as no modifications are made to its files without the author permission.